Lyrique Quintette Release New Album, "Arrivals and Departures: Music of the Americas"
The Lyrique Quintette has officially released their new album, Arrivals and Departures: Music of the Americas, and a launch event will be held this Sunday at 21c Museum Hotel. The album features a variety of music from across the American continents, including composers from Canada, the United States, Mexico, Uruguay, Argentina, and Cuba. Arrivals and Departures: Music of the Americas offers a diversity of styles and composers to represent different cultures throughout the Americas. The album has already garnered some attention with one reviewer calling the album "fascinating" and full of interesting music (The Art Lounge). 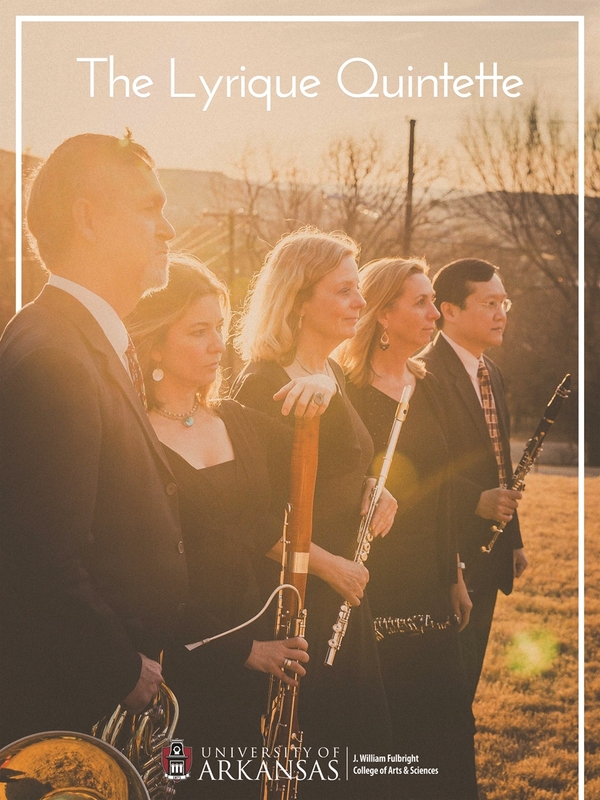 The Lyrique Quintette, comprised of Ronda Mains (flute), Theresa Delaplain (oboe), Nophachai Cholthitchanta (clarinet), Lia Uribe (bassoon), and Timothy Thompson (horn), commissioned and performed several new works for their album. Among the pieces included on the album are Miguel del Aguila's Woodwind Quintet No. 3 and University of Arkansas composer Robert K. Mueller's Veni Variationes. Also included are works by Mathieu Lussier, Mario Lavista, Adriana Verdié, and Paquito D'Rivera — four of the works on the album of seven are world premiere pieces. Funding for the commissions and recording came from the J. William Fulbright College of Arts and Sciences and the Department of Music. The recording took place at the Faulkner Performing Arts Center with Mark Records of New York providing recording services. The album was recorded in two sessions in May and September of 2017 and the quintet spent the months following the sessions listening to, detailing, and editing the recordings. "You have to be really focused on everything that you hear to understand how it fits together," said Theresa Delaplain, Lyrique Quintette oboist. This significant editing process even required the quintet to add several hours' worth of rehearsals to their schedules to jointly analyze their recordings. "I really appreciated that my listening skills improved from doing all the editing," Delaplain said. "It really helped me grow as a musician." In addition to producing their new album, the Lyrique Quintette recently traveled to Spain to perform at the Conference of the International Double Reed Society. The Lyrique Quintette was selected to perform at the conference after their proposal made it through a very competitive selection process. "It was great because we were in a high profile performance situation, but it was music we knew really well," Delaplain said. The group performed a number of pieces from their new album. The release party for Arrivals and Departures: Music of the Americas will be at 8 p.m. this Sunday, Sept. 16, at 21c Museum Hotel in Bentonville. The quintet will perform repertoire from the album and commissioned composers Miguel Del Aguila and Robert Mueller will be in attendance to discuss their works. On Oct. 17 at 7:30 p.m., the quintet will have an on-campus encore performance in Stella Boyle Smith Concert Hall. As the quintet continues to promote their album, they will also be preparing new music to perform as part of the University of Arkansas SHE: Festival of Women in Music happening next March as part of Women's History Month.